A weekend mountain bike ride designed for the enduro and gravity-oriented bikers. We will take you to the best trails of Borovets Mountain Bike Park and some of the long natural single tracks of Rila, with vertical drop of about 1000m each. We’ll spend the night in Sapareva Bania spa resort, famous for its numerous hot springs, one of which is the hottest one in Europe at 101 degrees centigrade. We start with one hour transfer to the oldest Bulgarian mountain and ski resort Borovets which is the host to one of the best downhill mountain bike races in the country. We will use the lift and try out all of the trails in the bike park. Our last ride for the day will be a blast with about 1200m vertical drop. We will use the gondola up to 2400m, pedal and push the bikes a bit, enjoy the view of 3 glacier lakes, and start a thrilling descend down a rocky single track in a kingdom of dwarf pines. After we’ll go lower and get to a fast spruce forest trail that will take us down to Borovets. We get in the van and drive for about 40 min to Sapareva Bania village where we can relax our bodies in the thermal pools and then have a delicious dinner in a local restaurant. Today we play rougher. We drive up a winding mountain road and then start hiking carrying/pushing the bikes for about an hour to get to the sub alpine zone and an open single track through juniper bushes. We climb up to a peak of 2300m where we start descending. The first part requires going down the peak in a free-ride style among the grass and rocks, then we get to a single track that passes through meadows, rocky forest sections and sandstone trails at the end. We will have a view to stop and enjoy – a beautiful cascade of three waterfalls in the distance. We stop for lunch in town. We have the option to do a few other short natural single tracks in the forest or relax in and around the mineral pools. Drive back to Sofia. 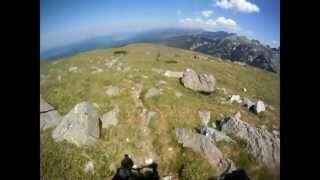 Rila Mountain has a special place in the hearts of Balkan Vagabondz. It’s a natural sanctuary, a precious habitat for plants and wild life merging into a diverse eco system worth preserving for the next generations. It has a unique place in Bulgarian spiritual history as the home of the first Bulgarian hermit “Saint John of Rila” (Sveti Ivan Rilski). It was named “Roula” by the Thracians which meant “full of water”. Some of the wildest rivers originate from Rila (the name was slightly modified by the Slavs). The mountain has 120 lakes, 70 of which date back to the Ice Age. It is home to more than 100 peaks above 2000m and it is the highest mountain on the Balkan Peninsula. A place of natural beauty and extraordinary energy Rila will stay in your memories forever should you choose to experience this enchanted wonder of Mother Nature. Borovets Mountain Bike Park was set up in 2010 and has over 20km marked trails with different levels of difficulty. The park’s pride is the 2400m long downhill trail suitable for holding international competitions. Sitnyakovo Express lift allows to hook the bikes on the side of the chairs. In less than 12 minutes one can reach the starting line of an unforgettable adventure. For more information check out the Borovets Mountain Bike Park FB Page. If you bring your own bike, please get a personal riding repair kit – tool, inner tube/s, pump.